Many people bring their lunch to work to save money, time and to help control what they are eating (with no hidden nasties from processed shop-bought food), but sometimes it's hard to think of interesting, nutritious things to make. Sara has come to the rescue with her vibrant, fun and inspirational approach to lunch boxes. She concentrates on having 5 clear elements: complex carbs, protein, fruit and veg, and sprinkles as well as the 5 colours used in authentic Japanese cooking: red, white, black, yellow and green. With just a few essential ingredients, you add your extras to create highly nutritious, vegetarian, colourful boxes of joy. Sara includes ideas for bento breakfast boxes (Sesame Snap Granola Bento and Mighty Muesli), 15-minute bento (Busy Days Instant Noodles and Lazy Tamago Bento), Everyday bento (Red Velvet Quinoa Bento, Green Theme Bento and Zen Bento) and the Fantasy bento (Starry Sky Bento and Fairy Jewel Box Bento). 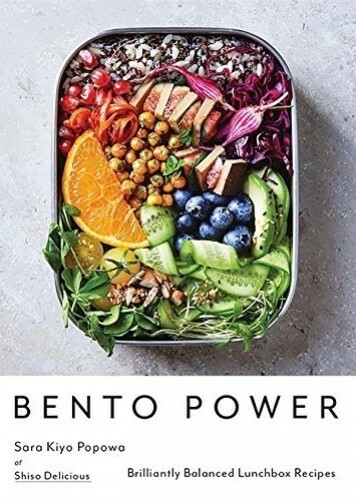 With tips on how to stock your bento store-cupboard and basic ingredients and recipes to get you going, now is the time for bento to bounce into your breakfast, lunch box, or even into your dinner parties, filling you with Bento Power!